One of the more desirable species of triggerfish the Blue throated or blue cheeked trigger originates from the western tropical Indo-Pacific including South Africa, Australia and Indonesia where it is found in relatively deep water up to a very respectable 150m. It is certainly a stunning fish. The male of this species is larger than the female and can be distinguished by the prominent blue throat/cheek patch and yellow margins to the dorsal, ventral and caudal fins. The female has a black margin to the caudal fin. The maximum reported size for this species is around 20-30cm. The temperament of this species is amongst the most placid of all triggerfish and thus it is highly prized by aquarists. It is possible to house a male specimen with at least one female given an aquarium of suitable size. There are several references to the “invertebrate compatibility” of this species in the literature. However, this is too broad a term and could lead to confusion. 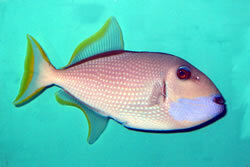 The blue-throated trigger feeds mainly on zooplankton in its natural environment and so arguably has less inclination to do the damage to rockwork, or indeed other aquarium inhabitants, that many other members of the triggerfish family seem to enjoy. Small specimens in a reef situation are unlikely to do any harm to sessile invertebrates, shrimp, urchins or crustaceans. However, large individuals do present a threat to crustaceans and potentially urchins so perhaps the best way to describe their suitability for reef aquaria is “sessile invertebrate compatible” – but keep an eye on those shrimp! A female specimen. She lacks the blue throat and is considerably smaller than the male. Given the relatively large potential size this species should be kept in aquaria with sufficient capacity to hold the full-sized fish plus care should be taken with smaller, less robust fish which may be out-competed for food when the blue-throat gets over its initial shy phase. The relative timidity compared to many other triggerfish species may be reflected in the fact that this species is seldom seen in depths less than 20 metres. Thus it is a fish which may prefer slightly lower light levels than found in many marine aquaria. So what will you have to pay for such a fish? Well, males certainly command a high price but then they are generally larger than females and so shipping costs will be higher. They are also relatively less abundant which will also have an effect on their end price. An adult male in full colouration will set you back around £65-£75 on average. Females change hands for approximately £35-£50 depending upon their size and where they have been sourced from. Scott Michael. Marine Fish Pocket Guide. Burgess, Axelrod and Hunziker. Dr. Burgess’s Atlas of Marine Aquarium Fishes. Kuiter & Debelius, 2001. Marine Atlas Volume 1. c. Mergus Publishing.